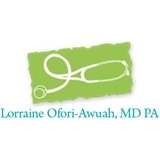 Lorraine Ofori-Awuah, MD, PA (Nottingham) - Book Appointment Online! Dr. Ofori-Awuah earned her medical degree from the University of Ghana followed by a rigorous internal medicine residency at the Good Samaritan Hospital. She has admitting privileges at Good Samaritan Hospital, Franklin Square Hospital and Upper Chesapeake Medical Campus. For over eight years, Lorraine Ofori-Awuah, MD PA (LO-A MD PA) has provided first class primary care for patients in Baltimore County. LO-A MD PA’s three-part mission of preventative, acute management and rehabilitative care has formed an important core which ultimately brings the highest customized standard of care to the patients in our practice.